To meddle, or not to meddle? From the First Doctor’s urgent proclamation in The Aztecs, the one single dilemma that every companion of the Doctor’s ponders at some point during their journey is whether or not to affect the course of history. Repeatedly, the Doctor stresses that the purpose of their trips through time and space are to simply observe and enjoy, to experience new things and see new wonders…and in the process, the actions of the Doctor and his companions either become PART of history or their actions go about setting history to take its proper path, saving it from someone else’s meddling machinations. Or sometimes, the Doctor just starts the Great London Fire. Every now and then, however, the Doctor and companion find themselves at a pivotal point in history, one where something momentous and wonderful, or something dangerous and life-threatening, is about to happen. An event where, to the Doctor or the companion, the outcome is well known and not for a moment lies in doubt, and to change that one moment is to change everything that comes afterwards. In The Aztecs, the companion Barbara dressed up as the goddess Yetaxa in an attempt to change the Aztec religion’s focus on human sacrifice, thus saving the Aztecs from destruction at the hands of the Spanish and radically changing Earth’s history. In The Fires of Pompeii, Donna Noble and the Doctor discover that he is responsible for the eruption of Mount Vesuvius, causing the destruction of Pompeii, due to his defeat of an alien race. Donna pleads with him to stop the eruption and save the city, but due to the eruption being a “fixed point in time,” there’s nothing the Doctor can do. It’s a powerful message throughout the series; sometimes, the Doctor and his companions, who travel to observe, are reduced to nothing BUT observers. The Aztecs continued their human sacrifices, and Mount Vesuvius erupted into a fountain of lava and ash. All the power in the universe, the ability to go anywhere, anytime, but being able to do nothing by stand by helplessly and watch as history takes its natural course. Big Finish has produced several audios along these lines. In The Fires of Vulcan, the Seventh Doctor is willing to accept his fate as the evidence around him shows that the TARDIS will be buried under the ash cloud of Vesuvius, doing very little to interact with anyone around him. Spare Parts goes the opposite route, where Five desperately attempts to halt the development of the Cybermen, only to have their evolution begin again the moment he departs from Mondas. The Wrath of the Iceni is set during a critical time in the history of the British Isles. A story of revenge set during a barbarian uprising, the story asks a basic question; if you had the chance to change history for the better, even though someone told you it was wrong, would you do it? And how much would you throw away in order to do so? A strong script and great sound effects set the stage for a serial that’s less about the Doctor’s choices and more about those of the companion. 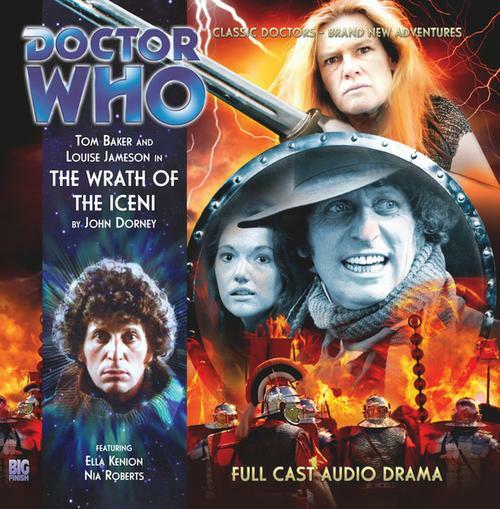 The Wrath of the Iceni is written by a long-time member of Big Finish team. John Dorney has written for several of Big Finish’s ranges, including Sapphire and Steel and Bernice Summerfield. For Doctor Who, he’s penned the well-received Companion Chronicle Solitaire and several Lost Stories releases starring Peter Davison and Colin Baker, as well as playing supporting roles through Big Finish. Who fans would best know him as Bob Dovie, the key to the Master’s diabolic plot in The Light at the End. Dorney’s script benefits from the hour-long format that the Fourth Doctor Adventures has adapted. It’s a very tight story that wastes little time, quickly moving from one scene to the next by pulling and pushing the listener, sometimes even shoving them. Make no mistake, The Wrath of the Iceni is a very hard hitting, violent, brutal story. There are two full-blow battle scenes, but we have beheadings, stabbings, murder, interrogation, torture…Dorney’s script pulls very few punches, which is appropriate for a story about armed rebellion. The sound team for Big Finish hasn’t pulled any punches, either, as the march of armies, the crackling of a campfire, the breaking of branches and the sound of spears clanging against shields all ring through the listener’s ears with one of the best sound landscapes Big Finish has put together. Between the script and the sound effects, The Wrath of the Iceni is one of the most immersive audio stories, throwing the listener into first century Britain for all its beauty and savagery. There aren’t any aliens here, no dastardly schemes from another world or a visitor running the show behind the scenes. The Wrath of the Iceni is a pure historical, one that puts itself squarely in the middle of a key and much researched point in British history. As the fierce Warrior Queen Boudica, picking Ella Kenion to portray her might give anyone who knows her body of work a moment’s pause. Best known as a comedic actress, Kenion has starred in several BBC sitcoms and sketch comedies, including The Catherine Tate Show. In the “behind the scenes” segments that come with the story, Kenion says that she’s “best known for comedies and portraying lesbians” and wanted to try something a little different. Kenion succeeds in spades with her portrayal of Boudica. It would be incredibly easy to play Boudica as a wide-eyed, wild warrior woman interested only in warfare, but instead of just chewing the scenery, Kenion’s performance is a mix of both simmering anger and explosive rage. In combat, Boudica is the equal of any man, a proud warrior who bests two Romans with ease. But she has no qualms killing a surrendering foe, either. Kenion gives the listen a sense of Boudica’s anger and outrage as she tells Leela about what the Romans did to both her and her family/tribe, but that anger and outrage is also focused on the Doctor when he refuses to tell her how history will unfold. Kenion’s portrayal is a bit different from the romanticized freedom fighter that some historians have labled her. Instead, Boudica is focused on nothing but vengeance, and woe to any who stand in her way. Kenion manages to follow a long-time rule of the theater, “anger is more than simply yelling,” in the role of Boudica, letting her choices, decisions, and actions add to the dialogue to drive home her fury and anger. The vocal rust is off Tom Baker’s voice in this one. As this is more Leela’s story than the Doctor’s story, Baker downshifts a little bit, quite possibly for the first time in his career. The charm and buffoonery are still present, of course, especially a running gag concerning the game “I Spy,” but the Doctor is at his most serious once he realizes that his companion’s actions will have a serious impact upon history. There’s little yelling or raising of his voice, but Baker conveys the urgency of the situation, both in eager tones and weary resignation. But the Doctor’s worry doesn’t come from the situation as hand, or at the possibility of massive chronological destruction, but at the fate of his companion. The chemistry between Tom Baker and Louise Jameson has been wonderful so far in the Fourth Doctor Adventures, and The Wrath of the Iceni is the audio that went beyond the banter and bickering. This might be the first time I felt the Doctor truly cared for Leela’s wellbeing and saw her more than just a temporary travelling companion. Jameson runs the gamut of emotions in this serial and does so wonderfully. There are none of the comical misunderstandings that come from Leela being a fish out of water. 1st century AD Britain is HER environment, one she knows better than the Doctor’s, which makes her realization about Boudica have even more of an impact. But it’s not an easy decision; no matter which way Leela goes, Doctor or Boudica, she will have betrayed her personal code. Much like how Sarah Sutton’s performances for Big Finish have given me a whole new appreciation for Nyssa, Louise Jameson has let me see Leela in a whole new light. Synopsis – Leela takes the spotlight in The Wrath of the Iceni, a story whose script and performances, along with some of Big Finish’s best sound work, asks the vital questions about loyalty and the opportunity to change history. 5/5. Tom Baker is the Doctor in…Energy of the Daleks. This entry was posted in Big Finish Review and tagged 5/5, Big Finish, Doctor Who, Fourth Doctor, Leela, Louise Jameson, TARDIS, Tom Baker. Bookmark the permalink.